After battling the walkers in the pit, the Governor is rescued by Martinez and his new group. Pulling him and Megan out of the pit, Martinez makes it clear that the Governor is not in charge and must pull his weight in order to stay with the new group. As the Governor and the girls settle into the new camp, Megan continues to ask questions about the state of their lives. He comforts her by stating that she is a good girl but never responds to her question about whether he is a good man. The Governor agrees to go with Martinez and a couple of his men on a supply run while Lily and Tara begin to take their roles helping the camp with first aid. On the trip, the group discovers a pattern of bodies leading them to a house that are slaughtered and labeled with their sins. Inside, they battle a group of walkers in the basement, including some of the decapitated heads. In the cabin that night, Martinez states that he only saved the Governor from the pit because he was with the girls but also acknowledges that he can sense a change. Questioning the story behind the bodies, the Governor becomes a focus of the men, seeking to find out who he is. Pete and Mitch talk about their former lives as military men. The next day, they return to camp and the girls talk about their appreciation for the new camp. Martinez stops by the Governor’s new camper with golf clubs and tells him that Shumpert died before they found him in the pit. Shumpert had seemed to be unable to handle things after Woodbury and just gave up. While Martinez is busy talking about life in the camp and possibly sharing the trouble, the Governor slams him with a golf club and drags him to the walker pit. Martinez fights back but ends up getting pulled in while the Governor just watches him get eaten. That evening, Lily returns to the campers and finds the Governor shivering about something, but he says that he cannot remember what was affecting him. The group reconvenes the next morning and announces that Martinez was found dead in the pit. The group is startled and struggling with the news, but they decide to have a vote about who should lead moving forward. The Governor follows Pete and Mitch on another run and find another camp in the woods. Pete struggles with the idea of attacking the camp and leads the two men in a different direction. Only finding limited supplies, Mitch gets seriously upset with their lack of success. They come back on the camp in the woods to find the group gunned down and the supplies pillaged. Mitch dispatches the last man who is barely breathing on the ground and appears to be seriously done with Pete’s inability to act. After returning to the camp, the Governor frantically returns to the camper and tells Lily and Megan to get packed and ready to leave. Concerned that another disaster is about to strike the camp, he gets the girls in a car and takes them back on the road. They pull up on a herd of walkers stuck in the mud, attempting to pull themselves out. 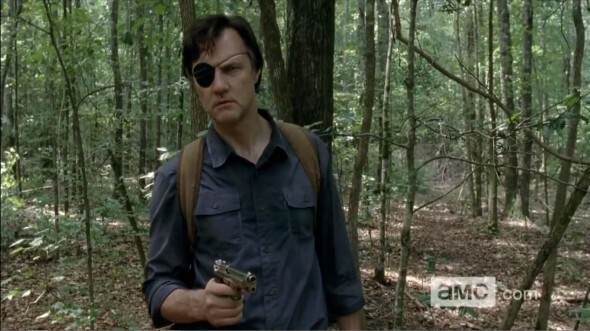 Standing in front of the walkers, the Governor just looks back at the girls and ends up taking them back to the camp. Lily wakes up to see the Governor strapping on his gun belt just before he leaves to go talk to Pete. When he walks into the camper, he stabs Pete and kills him. He immediately leaves and goes to Mitch’s trailer and holds him up at gunpoint. After telling Mitch that Pete is dead, he explains that he was on Mitch’s side with needing to take the camp in the woods. Offering him a cigarette, he tells a story about his brother taking responsibility for stealing cigarettes when they were kids. The Governor offers Mitch a new perspective on moving forward together. They dump Pete in a nearby lake and make up a story to tell the rest of the camp. The Governor begins to take command of the group as he gives them new orders to secure the space and manage their supply runs. With Mitch quietly supporting him, the group seems to be taking his orders. Lily pleads with the Governor that they need to be happy with the camp being their new home. She explains that they can support each other but the conversation is broken up when Megan gets attacked by a walker. Tara tries to save her but the Governor steps in at just the right moment to shoot the walker in the head. Taking some time to himself and standing on the edge of the pier, he watches the zombified Pete struggling to resurface. Afterwards, he takes a truck by himself to the outskirts of the prison and contemplates coming out of the bushes to shoot Rick and Carl, who are tending to their garden. Deciding to walk away, he finds Hershel and Michonne and points his gun at the pair. Reaction: The Governor is back! While the previous episode was a bit of an emo trip for our favorite villain, this episode was a resurgence of everything that used to be the Woodbury version of himself. While he went along with Martinez and the military guys to start his time with the camp and seemed to be confirming his new family’s comfort in their new home, the Governor was doomed to try and shed his past self. He used his identity as Brian to fool himself to becoming a better person. It is unclear if his protection of the family is guiding him to make the gruesome decisions to take on a leadership position again or if the family is an excuse to fool himself into his decisions. It is certainly clear that reuniting with Martinez and a new crew of people sparked the obsession with getting vengeance on Rick and the prison for their continued survival. 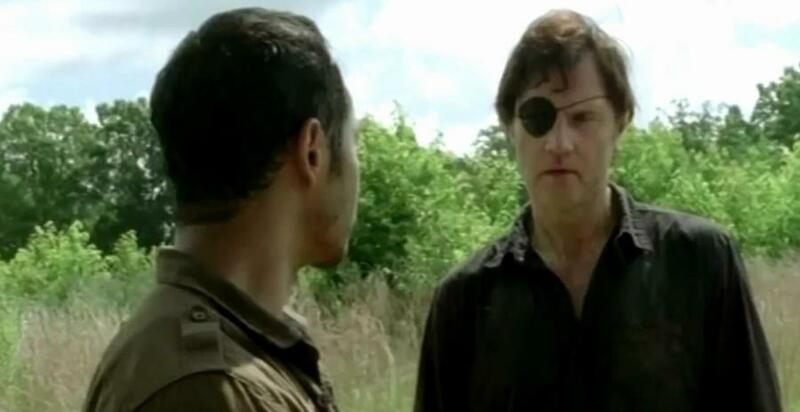 Martinez met his end in this episode all because he allowed the Governor to join his new group. Though Martinez was witness to the Governor’s gruesome and chaotic ways, he was somehow comforted by the way he defended himself and Megan in the pit. There seemed to be an understanding about their personalities and allowed them both to initially trust each other, but only Martinez seemed to let himself continue to trust in the Governor’s intentions. Feeling the pressure of keeping the group safe and functional, he first acknowledged that he thought he saw the change in the Governor’s personality and then opened up about his trust in the Governor’s leadership. This was all in vain since the Governor really had his own background plans to build up his army and take on the prison again. In essence, he allowed himself to show weakness and it was exploited. For newcomers Pete and Mitch, the brothers represented two ends of the survival spectrum. While Pete wanted to survive without confronting other human survivors and stealing from them, Mitch seemed comfortable with just killing them and taking their stuff. It was never explained what took out the camp in the woods, but the result seemed to suggest that Pete was not long for this world with the Governor still alive. Pete was a threat to the Governor because he would not be willing to follow the murderous rampage that the Governor planned to enact, while Mitch was definitely a legitimate follower with knowledge of working the tank in their camp. Martinez had been like Mitch back at Woodbury, but leadership changed him into more of a sensible, conscientious person. Mitch could be the strong link for the Governor to truly lead the attack on the prison. With the episode ending with the Governor holding his gun at Michonne and Hershel through the trees, it is clear that trouble is coming for Rick’s group and not everyone is going to survive.